Place the coconut milk, sugar, and cocoa powder in a medium saucepan and whisk until well combined. Warm on medium-low heat until the mixture just begins to simmer and get foamy. Remove from the heat and stir in the raspberries. Let rest for 20 minutes. Pour the mixture into a blender or food processor and process until smooth. Place a fine-mesh strainer over a medium bowl (or, to save on dishwashing, over the saucepan you used to heat the coconut milk). Pour the blended mixture into the strainer and press it through to remove the seeds. Cover and chill in the refrigerator for at least 3 hours. Then freeze in an ice cream maker according to the manufacturer’s directions. 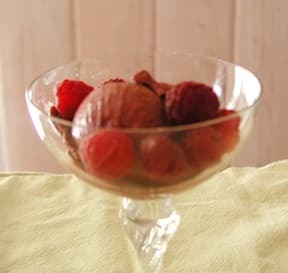 Explore more of Vegkitchen’s Vegan Ice Cream recipes. Cathe Olson is the author of Simply Natural Baby Food, The Vegetarian Mother’s Cookbook,* and For more information and sample recipes, visit Cathe at Simply Natural Books.